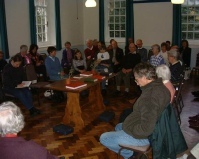 The East Kent area of the Religious Society of Friends consists of local Meetings in Ashford, Broadstairs, Canterbury, Faversham and Folkestone. There is also a monthly Meeting for Worship in Deal. To see details of the places and times of Meetings and other particulars concerning the individual Meetings, click on the links above. 'Quaker' is a popular name for a member of the Religious Society of Friends. (Members are also known as 'Friends'.) As Quakers we have no dogmas or creeds, believing that the truth cannot be reduced to a form of words. Nor do we have any one definition of God but we have the conviction that each of us can have direct experience of the Spirit of God and that our religious insights, attitudes and practices should come together in a way of life. A Quaker Meeting is based on silence - an expectant silence of waiting - in which we seek to come nearer to each other and to God. Sometimes a Meeting will pass in total silence. The silence may be broken if someone feels compelled by the Spirit to speak, pray or read. The Meeting ends after about an hour with the shaking of hands. Quaker Quest is a regular opportunity for those who want to find out more about the Quaker way to attend a session at Friends House, 173 Euston Road, London NW1 2BJ (opposite Euston Station) on any Monday evening 6.30 - 9.00 pm. The programme of events can be found on www.quakerquest.org or call 020 7251 0376. The Quaker Tapestry, based at Kendal Meeting House in the English Lake District, is a celebration of 350 years of Quaker insights and experiences embroidered in narrative crewel work on 77 panels of specially woven wool cloth by 4,000 men, women and children from 15 different countries. Each panel measures 25" (635mm) wide by 21" (533mm) deep. It is a very inspiring project and the panels are well worth seeing. More particulars about the exhibition can be found on the Tapestry's excellent website. Click on www.quaker-tapestry.co.uk to visit it. Through outward stillness, seek a calm within. Here feel the healing miracle begin. And wait in trust for "that of God" to speak. To the one source of comfort, love and power. Through all our daily life beyond this place.